If you think that traveling is more fun than arriving, then these awesome jigsaw puzzles are for you. This selection includes the world's most challenging, double-sided jigsaws as well as puzzles with up to 42,000 pieces. They'll keep you puzzling for a long time. The most iconic buildings, monuments, and mountains of every continent are featured on this huge 42,000-piece puzzle from Educa. It's touted as the world's largest puzzle and will measure 21 feet long by 5 feet tall when finished. Challenge yourself with Educa's 33,600-piece puzzle that comes with its own wooden wheeled carrying case. It's packaged in 10 separate bags so you can assemble it in sections. The final dimensions will be over 18 feet long and 5 feet wide. You'll need an awfully big dining room table to complete this jigsaw puzzle which caps out at 24,000 pieces and a finished measurement of about 14 feet by 5 feet. You may want to put your social obligations on hold for a while to tackle this beast from Educa Borras. The puzzle is manufactured in Barcelona, Spain. The company has a lost piece replacement guarantee. At 18,000 pieces, this puzzle from Ravensburger should keep you busy for a very long time. The finished size will measure 109 inches by 75.5 inches, which translates to 9 feet by 6.3 feet. They manufacture their puzzles in Germany to great precision. Their "softclick" technology ensures a perfect fit. This 18,000-piece puzzle from Ravensburger could ruin your social life and have you ready for the madhouse. All manner of items are hiding in this bookshelf that will measure 9 feet by 6.3 feet when completed. At 18,000 pieces, you will be thrilled with this colorful representation of a tropical paradise. As with other Ravensburger puzzles this size, it measures 109 inches by 75.5 inches when done. Delve into this masterpiece by 18th-century artist Giovanni Paolo Pannini, renowned for his depictions of Rome’s ancient and modern monuments. 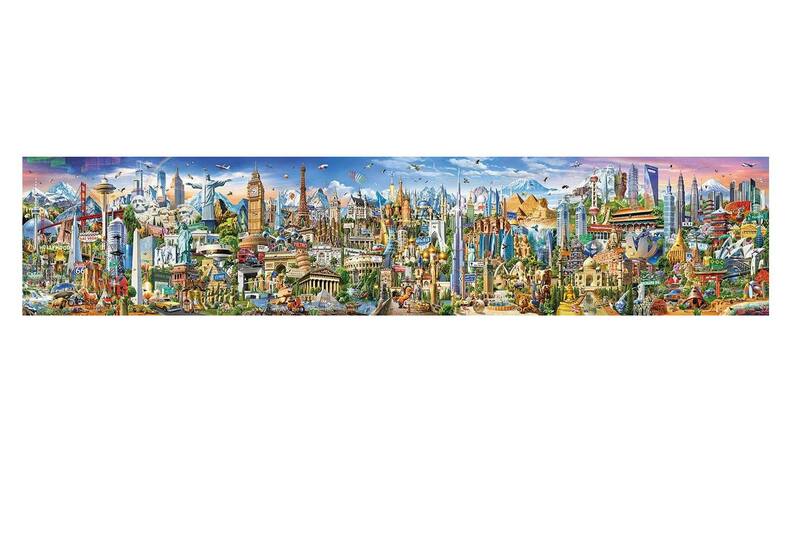 This puzzle from Ravensburger measures 61.75 inches by 42.14 inches and has 5,000 pieces. Assemble this challenging jigsaw puzzle with an astrological theme. This puzzle from Ravensburger has 9,000 pieces and measure 54 inches by 76 inches when done. Here's a colorful and challenging jigsaw puzzle with a Native American theme. Although the artist, David Penfound, is from England, he found that he had a connection with Native American Art and had his first exhibition in the U.S. featuring his Native American images. It is made by Sunsout and has 6,000 pieces with a finished size of 24 by 35 inches. Explore the exotic life under this sea while staying entertained for days with this 9,000-piece puzzle from Ravensburger. This challenging jigsaw puzzle from the World's Most Difficult Jigsaw Puzzles series is printed on both sides, making it necessary to examine each piece on both sides to determine its proper place. At least it's only 529 pieces and will measure a very manageable 15 inches square when done. Buffalo Games is the manufacturer. Sea turtles, dolphins and other denizens of the deep are featured in this challenging, 5,000-piece jigsaw puzzle from Ravensburger. This fun and challenging 500-piece double-sided World's Most Difficult jigsaw puzzles have the same artwork by Royce McClure on each side, but the reverse side is rotated 90 degrees. They are die-cut from both sides to make the front and back indistinguishable. This puzzle is 500 pieces and measures 15 inches square when done. This very challenging puzzle has only 529 pieces, but both sides of this jigsaw have been printed, cut, or pressed, so you need to compare shape, color, and fit on both sides.